When people seen Magnum, their perception of the breed fascinated me. To see him in his grand stature, big, bold look, made people very apprehensive and unwilling to trust, due to what people had heard of the breed, Rottwieler. 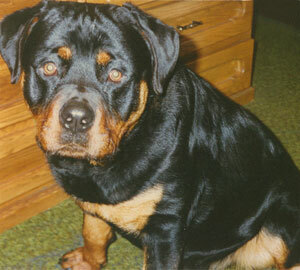 Magnum was my special dog, a dog I know I will never be able to even come close to replacing. He came into my life at a precious 7 weeks of age, fat and fluffy. The dark deep eyes melted my heart every day of his life. Just to look at him made me smile on an every day basis. I took him EVERYWHERE with me. He enjoyed camping, swimming, visiting nursing homes and any where else there were people. 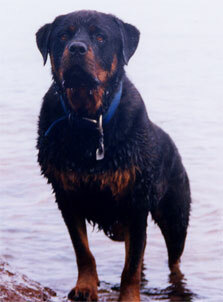 No one could believe what a wonderful dog a Rottwieler could be, until they met him. He was quick to give a kiss to anyone or anything that was willing to let him. My friend had developed arthritis in his hips at an early age due to hip displaysia that was bearable in the summer and miserable in the winter for many years. I continued treating him daily with medication and joint supplements, confining his activities, helping him up and down stairs, and regardless of his discomfort, his happy little stubby tail would continue to wiggle. I knew eventually I would have to make the decision to end his suffering, regardless that he was still eating well, playing as often as possible and still was happy. The decision would never be easy, but then he started to limp in his front. Due to him compensating for his weak back end, the majority of his movements had to be relied on by his 2 front legs. After several years of wear and tear on those front legs, he developed tendonitis in his front left, which became almost unbearable. Now not only did he have 2 sore back legs, but 1 in front too. The day he decided to wiggle his way into my car, just as I was leaving for work, I made the decision to say good bye to my dear friend. Unfortunately, he couldn’t tell me how bad the pain was, but I knew in my heart the best thing I could do for him was to end his suffering. Though it was not an easy decision, sometimes the last thing that we can do for our beloved pets is to gently put them to sleep. With the help from Dr. Meaghan, we layed outside on the grass to put my baby to rest, with his head on my lap, he looked up one more time and gave me a kiss. He no longer was in pain. We all cried at work, and I continue to get a tear in my eye every time I think of him. He was my friend, my companion and part of my heart, I will never forget all the joy that he brought to my life.